MIAMI (AP) Jake Arrieta's 100th career victory left him in a mood to look back - and ahead. "On to 200," the 33-year-old right-hander said. 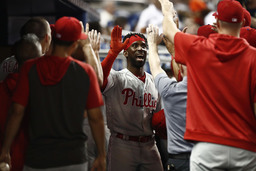 That sounds good to the Philadelphia Phillies, who benefited from Arrieta's seven-inning effort Friday to send the Miami Marlins to their fifth consecutive loss, 9-1 on Friday night. Arrieta (2-1) allowed one run and five hits, struck out eight and lowered his ERA to 2.25 in three starts. The former NL Cy Young Award winner improved to 100-68 in 10 seasons. "Accomplishing something like I did tonight makes you appreciate everything you go through - a lot of ups and downs and figuring some things out, forgetting some things, relearning them," Arrieta said. "This game is very humbling, and I'll never forget that." He's the 18th active pitcher to reach the victory milestone. "Quite an accomplishment," manager Gabe Kapler said. "Just a proud moment for the club." Arrieta took a 6-0 lead into the seventh, when Miami ended a streak of 21 consecutive scoreless innings on Austin Dean's sacrifice fly. The Marlins have lost nine of their past 10 games, and they've been outscored 30-2 in the past four. Manager Don Mattingly said Arrieta a big factor in the latest feeble offensive effort. "Their guy was really good," Mattingly said. "He got ahead in the count. His command was as good as we've seen this year. He was able to throw strikes with a lot of different pitches." The Phillies' J.T. Realmuto hit into a double play with the bases loaded to end the first inning, but finished with two hits, two runs and an RBI. He made a nifty headfirst slide to score from third on a bloop single in the fifth. The game was Realmuto's first at Marlins Park since Miami traded him in February. Andrew McCutchen had three hits, including a three-run homer in the eighth. The Phillies' leadoff hitter set the tone in the first inning by going from first to third on a single to left. Florida native McCutchen has homered in his past three games at Marlins Park. "It's always nice to come back to my home state," he said. "I got a fresh haircut today, and it felt really good. I had the look good, feel good part down. So I just needed to play good. I got that out of the way too." Bryce Harper had an RBI and two hits to hike his average to .325 as the Phillies tied a season high with 14 hits. "Every day you learn," said Marlins catcher Jorge Alfaro, who had two of their five hits. "We battled. We tried to stay positive." The Phillies recalled RHP Victor Arano from Triple-A Lehigh Valley, and he pitched a hitless eighth and ninth. The Marlins optioned OF Peter O'Brien to Triple-A New Orleans and recalled Dean from New Orleans.